never pinpointed in daily papers, since “loose lips sink ships.” Shrapnel and a few unexploded shells fell from the skies, smashing into sidewalks, driveways and even a few homes. Miraculously, there were only five deaths reported, and those were due to traffic accidents and a couple of heart attacks. The term “flying saucer” would not be invented until more than five years in the future, when Kenneth Arnold would see a group of objects from his plane in Washington State and described their movement as “like a saucer skipped across water.” Although newspapers continually referred to the invaders as “planes” or possibly “blimps” no one could agree on their size or even the number of targets. Reports ranged from one object to perhaps fifty. At 2:25, a general blackout was ordered and lights began going off from northern L.A. down to the Mexican border. Though residents were asked to stay indoors, many could not resist the free show and crowded out onto sidewalks and balconies. There was even a “blackout murder” as one killer took advantage of the darkness to beat a 40 year-old woman to death in a rooming house. Army observers looking at the celestial fracas through binoculars from atop a tower in Culver City thought they saw a group of silvery objects which they assumed were airplanes. All witnesses agreed that the things came in from the northwest (probably from the ocean) near Santa Monica and moved southwest in a leisurely fashion until they disappeared somewhere south of Long Beach. Because all lights in the city had been turned off, stars shined on the moonless night with an intensity most had never seen. 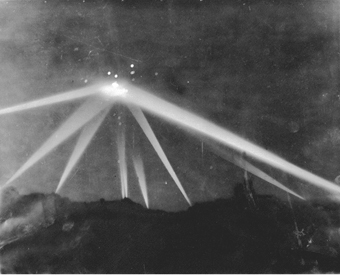 When the “attack” began, powerful searchlights lit up the early morning sky, converging on the object (or group of objects) so that the gun batteries could get a good bead on the thing. The UFO never changed direction or speed, even with the combined firing of hundreds of anti-aircraft guns, many of which scored direct hits. The whole thing lasted for about a half-hour, as the “mystery planes” took their sweet time traveling 20 or so miles across the night sky. Optical physicist Bruce Maccabee performed a detailed analysis of one of the dramatic original negatives from the Los Angeles Times. Taking into account the size of the searchlight beams, the angle of incidence from the ground, and reported altitude of the target, he estimated that the UFO was measured anywhere from 100 to 300 feet from end-to-end.2 The strange thing about contemporary news accounts is the glaring lack of any concrete guess as to what exactly was floating over a metropolis of 3 million people that night. 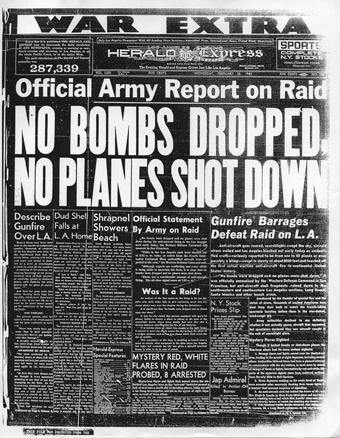 An analysis of the first report on the firing in the Los Angeles area early today fails to give convincing proof that any enemy planes were over Los Angeles during the disturbance. It is significant that “no bombs were dropped and no planes were shot down.” It may be also stated that persons equipped with powerful glasses failed to discern a plane or planes at the apex of the searchlight beams where many people feel sure they saw a moving object or objects under the fire of our batteries. If a moving plane or object was caught in the light beams, it seemed to move too slowly across the sky to have the speed of a modern airplane, such as our own planes which flash across the sky so rapidly. This newspaper, at this time, is unwilling to hazard even a guess on exactly what transpired in the skies above Los Angeles last night, but certainly the city was given a splendid practical lesson on what to do in case of attack. A quick-thinking advertiser in the Herald Express placed and ad for bargain “Blackout Window Shades” next to stories about the raid, and Hearst’s editors reported on a “rising chorus of demands that the United States Government immediately evacuate from Southern California all Japanese—alien and American –born alike.” Curiously, the only quotes from the “chorus” were attributed to two Congressmen from Santa Monica calling for “concentration camps.” This of course actually happened a few months later. The paper also quoted unnamed civilians who had observed Japanese people signaling to the sky with flashlights and flares. As for the mystery flying objects, perhaps the “persons equipped with powerful glasses” didn’t know how to get their minds around what they were seeing until later sightings and popular culture provided them with a mental box labeled “Flying Saucer” in which to place their observations and memories. One writer noted that a number of Japanese citizens were arrested and questioned, “including several aliens.” The aliens were probably mistaken for Japanese and sent to the camps as well. The answers were right under the noses of the authorities!